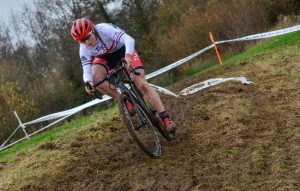 Toby Barnes (Lichfield City CC) and Harriet Harnden (T-Mo Racing) took victories in the senior men’s and women’s races respectively at the West Midlands Cyclo-Cross Champions. Both riders have shown their strengths so far in the regional series and added the title to their collections. Cob House Country Park in Worcestershire hosted its first ever cyclo-cross race and the course organised by Malvern Cycle Sport tested riders to their limits. The first half of the course involved fast grassy terrain followed by some muddy running sections and difficult off-camber corners. Under-23 rider Barnes continued his emphatic form with a faultless performance in the men’s senior event riding away from his rivals to win by almost three minutes. Toby Barnes won the men’s event. Behind host club rider Liam Killeen (Malvern Cycle Sport) led the chase for second but constantly lost time to the leader. The main battle behind saw Ewan Grivell-Mellor (Mid Shropshire Whls) chase after Killeen before settling into a lone third place, but in the final third of the race he was being caught by Ross Harnden (Malvern Cycle Sport) holding onto bronze by 16 seconds. “It was a really good course and it was quite technical with the off-cambers,” said Barnes. The West Midlands Championships saw a separate event for the junior and veteran 40-50 age category riders starting separately. Local rider Simon Wyllie (Halesowen A&CC), from Worcester, dominated the junior category to win by a minute and 21 seconds. The battle for the remaining podium places was a close one between Edward Woodward (MI Racing) and Matthew Kinston (Lichfield City CC) split by a single second with the former just edging second place. Local knowledge also proved key at the new venue for Ed Moseley (Malvern Cycle Sport) who took another victory for the Worcestershire contingent. Moseley started slower and was fifth following the opening lap before working his way back up to the leaders and taking the head of the race from the half-way point before holding on for victory. Behind Colin Miller (Ride Coventry) edged out second place ahead of Phillip Glaze (Stourbridge CC) in third. The women’s race saw an intriguing battle develop between junior riders Harnden and Josie Nelson (RST/Cycle Division Racing). After dominating the previous round at Stourport, Malvern-based Harnden took the front from the outset but was soon joined by young rival Nelson. With two laps to go Harnden eventually powered clear and took victory by 43 seconds at the finish. Harriet Harnden on her way to winning the women’s event. “It was not what I was expecting but I knew Josie was good as she has got some really good results,” said Harnden. Behind the leading juniors Isla Rowntree led the battle behind in third place overall and took the first veteran prize. Rowntree led the veteran field from the opening lap and edged out a clear advantage to win the category by one minute and 23 seconds and also third overall. Behind veteran riders Verity Appleyard (Brotherton Cycles) and Karen Summers were locked in a battle for second with the former just holding on from her fast finishing rival. Ellish Gilbert was the leading senior in sixth overall ahead of Melissa Baker (Team Empella Cyclo-Cross.com) in second and Sophie Fennell (Performance Cycles) in third. Mark James (Team Jewson-MI Racing-Polypipe) led from the opening corner to take a fine solo victory in the veteran’s over-50 race. The improving rider from Hereford has won West Midlands, Welsh and Western rounds this season and showed his strength once again. After pulling out a lead of 45 seconds on the opening lap a crash while attempting to bunny-hop the hurdles saw James fly over the handlebars. However, he managed to regain any time lost and eventually won by 46 seconds. Behind Team Jewson-MI Racing-Polypipe team-mate Stephen Knight had to settle for second ahead of Stephen Whitehouse (Stourbridge CC) in third. 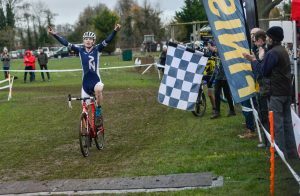 Ben Askey (RST/Cycle Division Race Team) proved to be the strongest as he came through to win the youth boy’s event in the under-16 category. The young rider from Cannock led from the opening lap but was then caught and passed by Alex Barker (Team Backstedt/Hotchillee) on the second lap. However, Askey responded and road away to take a clear win by 38 seconds with Barker second and Sullivan Berry (Redditch Road & Path CC) in third. Max Greensill (Rapid Racer Products) was a clear victor in the under-14 category ahead of Spencer Corder (Rotor Race Team) in second and Thomas White (Wolverhampton Whls) taking third. Grace Lister (Wolverhampton Whls) led from start to finish in the under-16 girl’s event with Isla Mason (Team Empella Cyclo-Cross.com) in second and Isla Blain (Halesowen A&CC) third under-16 girl but fourth overall girl. Third overall girl went to under-14 winner Ellie Swingell (Halesowen A&CC) ahead of Hannah Cockroft in second and Rebecca Woodvine (Mid Shropshire Whls).